cancer scientists who dared to declare cancerous connections to the widely used herbicide called glyphosate, the chief ingredient in Monsanto's Roundup brand. Industry swagger is on full display in Washington where Monsanto and its friends at CropLife America are driving efforts to cut off U.S. funding for the World Health Organization's International Agency for Research on Cancer (IARC) after IARC scientists declared glyphosate a probable human carcinogen in March 2015. The industry is also demanding that the Environmental Protection Agency fully repudiate the IARC classification and green-light continued use of glyphosate herbicides, which spell billions of dollars in sales annually to Monsanto and the agrichemical brethren. The EPA has been evaluating glyphosate as part of a re-registration review process for more than five years, and was initially expected to complete that review last year. The EPA then said it would complete the review by the end of 2016, and now says it will be 2017 before it offers a final report. The work has been drawn out as the EPA wrestles with the IARC classification, which has both legal and economic implications for the agrichemical industry. The EPA had planned to hold four days of public meetings - over industry objections- to examine scientific research on glyphosate. 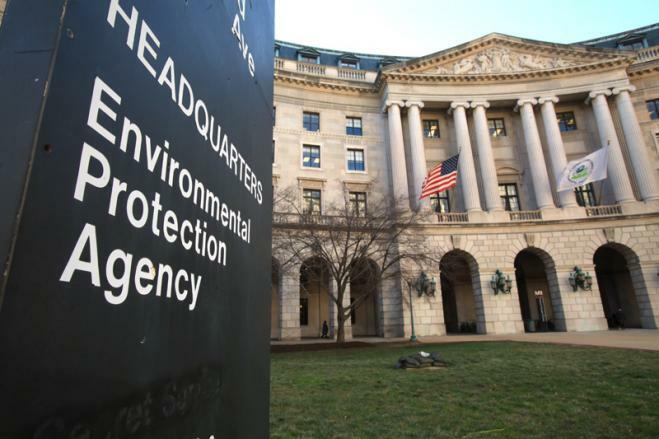 But the industry, which deemed the meetings "unnecessary" and "inappropriate," successfully derailed those Oct. 18-21 public meetings by challenging certain scientists appointed by EPA to an advisory panel. The EPA has "postponed" the meetings and has yet to reschedule. Now, industry ally U.S. Rep. Lamar Smith is taking EPA officials to task for engaging with IARC on glyphosate concerns, demanding that EPA instead rely on the "sound science" that the industry promotes. Smith, Chairman of the House Committee on Science, Space and Technology, accuses IARC of playing an "activist role" and EPA officials, of aiding that effort. In an Oct. 25 letter to EPA Administrator Gina McCarthy, Smith complained of "constant delays" by EPA in completing the re-registration of glyphosate, and demanded that EPA officials appear before his committee to explain themselves. Monsanto, which is fending off lawsuits by people who claim Roundup gave them cancer, has also been demanding IARC members turn over documents related to their work. The company has labeled the IARC findings as "junk science," and claims the IARC members are part of an "unelected, undemocratic, foreign body." It's all a bit overwhelming for the members of the IARC working group, who are not accustomed to assaults on their expertise. After all, these scientists that assembled for the glyphosate review were among the elite, routinely seen as independent experts, pulled from top institutions around the world. Frank Le Curieux, senior scientific officer at the European Chemicals Agency in Helsinki, Finland, and an expert in toxicology, was part of the team. So was French scientist Isabelle Baldi, who holds a Ph.D in epidemiology with a research specialty in environmental toxicology, and works as assistant professor in occupational epidemiology and public health at Bordeaux University. Experts also came from Australia, New Zealand, Canada, The Netherlands, and Nicaragua. Several came from the United States, including Matthew Martin, a biologist with the EPA's National Center for Computational Toxicology who received awards for his work with toxicity data. Aaron Blair, a scientist emeritus at the National Cancer Institute, served as chairman of the IARC team. Blair has specialty knowledge in research that focused on evaluating cancer and other disease risks associated with agricultural exposures, as well as chemicals in the workplace and the general environment. He has received numerous awards over his career and has served on many national and international scientific review groups, including for the EPA. He has also authored more than 450 publications on occupational and environmental causes of cancer. The fact that Monsanto and the agrichemical industry are coming after them has left them stunned. IARC issued a statement last week saying some also felt "intimidated" by the industry actions. "We were not expecting this strong reaction and what happened," said Francesco Forastiere, head of occupational epidemiology at the Lazio Regional Health Service in Italy who participated in glyphosate working group for IARC. "We were doing our job. We understood there were other issues... economic consequences. But none of us had a political agenda. We simply acted as scientists, evaluating the body of evidence, according to the IARC criteria." Another working group member, Australian epidemiologist Lin Fritschi, who has been part of other IARC classifications, said the team's work was solid and the industry attacks on the team's credibility are unwarranted. "I definitely wasn't expecting anything at all," said Fritschi, who specializes in the occupational causes of cancer and holds the "distinguished professor" title at Curtin University in Australia. "We were independent and just looked at the science. We had strict rules on what was admissible and came to a conclusion based on that evidence. We made the right decision based on the evidence." The team was not charged with doing new research, but rather with reviewing research already conducted, trying to determine how the various findings added up. The members analyzed older research as well as more recent studies, weighed the methods used, the consistency of results and the levels of adherence to research standards. There were numerous animal studies to pore over, but fewer looking at glyphosate connections to health problems in humans. The evidence with respect to cancer in humans came from studies of exposures, mostly in agricultural settings. The group determined that the best research showed a distinct association between non-Hodgkin lymphoma (NHL) and glyphosate. The team also noted that there were ties linking glyphosate to multiple myeloma, but the evidence for that disease was not as strong as the evidence tying glyphosate to NHL, the group determined. The team also evaluated several studies that showed animals developed rare kidney tumors and other health problems after exposure. Those studies combined to provide "sufficient evidence" of glyphosate's carcinogenicity in laboratory animals, the IARC team found. On top of that, the IARC team concluded that there was strong evidence of genotoxicity and oxidative stress from glyphosate, including findings of DNA damage in the peripheral blood of exposed humans. The team also said it was noteworthy that in one study, people showed chromosomal damage after glyphosate formulations were sprayed nearby. Overall, IARC concluded that there was "limited evidence" that glyphosate can cause non-Hodgkin lymphoma and "convincing evidence" that glyphosate can cause cancer in laboratory animals. The conclusion would have been for "sufficient" evidence of cancer problems for humans, but for one large U.S. study run by the federal government that did not show connections between cancer and glyphosate, Forastiere said. The team ultimately decided the weight of the evidence was not strong enough to say glyphosate was definitively carcinogenic, but there was more than enough evidence for the caveat "probably" carcinogenic. "We should all minimize our use as much as possible," said Fritschi, "The people most at risk are people who use glyphosate a lot, such as farmers and gardeners, and they are the ones who should try and reduce their use," she said. Monsanto and other industry players can't afford for that kind of talk to take root; which is exactly why we're seeing these extraordinary efforts to undermine the scientists and push EPA to ignore cancer concerns. One letter in particular submitted by CropLife America to EPA this month shows the depths of the industry's efforts to rein in EPA's probe of glyphosate. CropLife told the EPA it was out of line for proclaiming a need for independent research on formulated glyphosate products - such as Roundup. The agency said in September it has been collaborating with the National Toxicology Program of the National Institute of Environmental Health Sciences to develop a research plan to evaluate the role of glyphosate in product formulations and the differences in formulation toxicity. But apparently, it neglected to get industry permission. "We also question why EPA would collaborate and develop a research program with the National Toxicology Program without input from the registrant," CropLife wrote. "Should data be required to address specific questions relevant to the registration or reregistration of a product, the registrant would be the appropriate source of those data." The industry message to EPA is loud and clear: Independent research and international scientific findings should not take precedence over protection of a multi-billion-dollar agent like glyphosate. The public can only watch, wait, and hope that the EPA doesn't listen.